Deep sea fishing and light tackle fishing charter out of Fajardo, Puerto Rico. Over 25 years fishing for Tarpon,Tunas,Marlin,Snook,Kings,Snappers,Sharks, Wahoo and more. Captain Marcos Hanke (Marine Biologist) is the pioneer fishing guide out of Fajardo Bay, with multiple state and world records.Day and night fishing on fly or spinning tackle. 26' and 22' boat fully rigged. Fully equipped with live bait tanks and top electronics. Daily Fishing Reports for Los Suenos Marina Jaco Costa Rica as well as fishing charter information and information about other forms of entertainment in Costa Rica. If you're going to be visiting Costa Rica, then this is an excellent place to start! WE PROVIDE SPORT FISHING AND SNORKELING WITH A 38FT POWER CATAMARAN AT PALMAS DEL MAR, HUMACAO PR.. WE CAN CARRY UP TO 10 PASSANGER OR LES. WE ARE INSPECTED BY THE USCG WITH A COI INSPECTION. Antiguas No.1 Sportfishing Charter, 45' Hatteras Sportfisherman, tournament equipped, diesel powered and fully airconditioned.Tackle from 12-80 lbs. 4,6 and 8-hour charters for Marlin, Mahi-Mahi, Wahoo,Kingfish and Tunas. When you are ready to experience fishing in the Caribbean then you are ready for a Punta Cana sport fishing trip for marlin, tuna, dolphin, wahoo, and other big game sport fish in the fun and sun of the Island of the Dominican Republic. 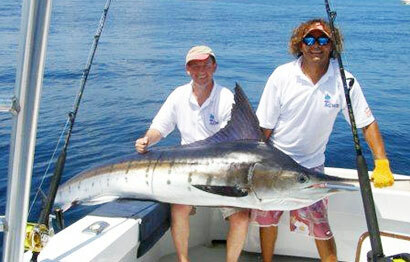 Amazing big game offshore fishing charters from Grand Turk, in the Turks and Caicos Islands. Target Species include, Tuna, Wahoo, Mahi Mahi, Marlin, Sail Fish and more. We offer full vacation packages with our new Screaming Reels Guest House accommodation.